Andrew Tate Condo #2-- DTN Bayfield Sleeps up to 4, Lake Views! BEST LAKE VIEW & LOCATION in downtown Bayfield, WI. just 1 block up from the harbor dock in Bayfield on Rittenhouse Ave & 1st Street. Andrew Tate Condo #200 (2nd Floor-Stairs) Sleeps 4. Newer building, new decor, luxurious. 1 Bedroom King, 1 Queen Sofa Sleeper in living room, Tub & shower combo. Fully equiped kitchen and washer and dryer. Walk to everything! Restaurants, Coffee Shops, Shops, Museums, all within 1/2 block to 2 blocks. Great music can be enjoyed from your own balcony across the street at The Bayfield Inn Deck & Concerts in Memorial Park next to the harbor dock! Balcony looks out at the Madeline Island Ferry, Madeline Island, harbor dock & downtown Bayfield. Best views in town and especially Apple Festival the first full weekend in October. 1 Bedroom King, 1 Queen Sofa sleeper with thick 6" mattress for comfort. Sleeps 4. Large 40" Flat Screen TV (Roku). FREE WiFi Internet. Excellent 5 Bar Cellular Service is also a plus for clear phone calls, fast texting, or email/internet for your Smart Phone. Andrew Tate Condo #200 is one of the newest most luxurious condo's in Bayfield. Best Location! Located in the heart of down town Bayfield,. The window and balcony views of up town, down town, Madeline Island, the harbor, and park are excellent, you will love it. "The most reviews on VRBO for Bayfield"
We chose this condo because it is the best location, best views, and newest most luxurious Condo in Bayfield, Wisconsin. We know that when new vistors come to our area, they will never forget the beauty. Bayfield during the peak season of May through October is never crowded. So many artist galleries to visit, trails to walk or bike and everything is within walking distance. In the morning enjoy that cup of coffee on the balcony, here the soft sounds of seaguls and look out at Madeline Island watching colorful Sail Boats, the Madeline Island Ferry, Kayaks, and so much more. One of the few 'Best View' condo's in Bayfield along with off street parking for 2 vehicles adjoining the Andrew Tate Condo #200. Excellent cellular phone coverage from this condo (a rarity this close to the water) you are never out of touch. In house electronic note book has high speed wireless internet. With a click of a button you can look up excursion trips, sail boat charters, kayak rentals, bike rentals, down hill or cross country skiing, and the Ice Caves just 12 miles North from the condo. Off street parking for 2 vehicles is just steps from the entrance. Tub & Shower combination. Towels, Toilet Paper, Soap, Shampoo, Conditioner & Hair dryer included. Right in the heart of downtown Bayfield, Wisconsin. Excellent Lake/ Madeline Island Views. 200' from the Water and main harbor dock. Walk to everything on flat ground! Just look out the windows or balcony and see the main Bayfield Harbor dock right there! Madeline Island, watch as the ferry and sail boats come in and go out Lake Superior just 1/2 block away! Just one half block from the water! Excellent views of the harbor, Madeline Island, Ferry, & Sail Boats from windows and balcony. Off Street parking, walk to everything! Just 1/2 block from main Bayfield, WI harbor dock at the end of Rittenhouse Ave. View Sail boats, Madeline Island Ferry going back and forth to Madeline, and colorful sail boats. Walk to everything! Parking for 2 cars in parking lot dedicated for building and just steps from entrance door. WIFI and electronic note pad for your use on the counter. Large 40' Flat Screen TV with ROKU. AM/FM CD Player, Queen Sofa Sleeper Couch, Comfortable Chair, Gas Fireplace, Professionally decorated. All Dishes, Utensils, coffee cups, and wine glasses included. All Cookware, dishware, silverware, Glasses & Wine Glasses. Portable AM/FM CD + I-pod plug in with small screen DVD player. Books on Lake Superior, Apostle Islands, Ship Wrecks, Bayfield History and more. Yahtzee, Hands Down, UNO, Playing Cards, Dice. Just across the street on Lake Superior is Memorial park. Take a stroll on the path past the marina, beautiful sail boats, down to a fishing dock. Fresh Fish for sale! 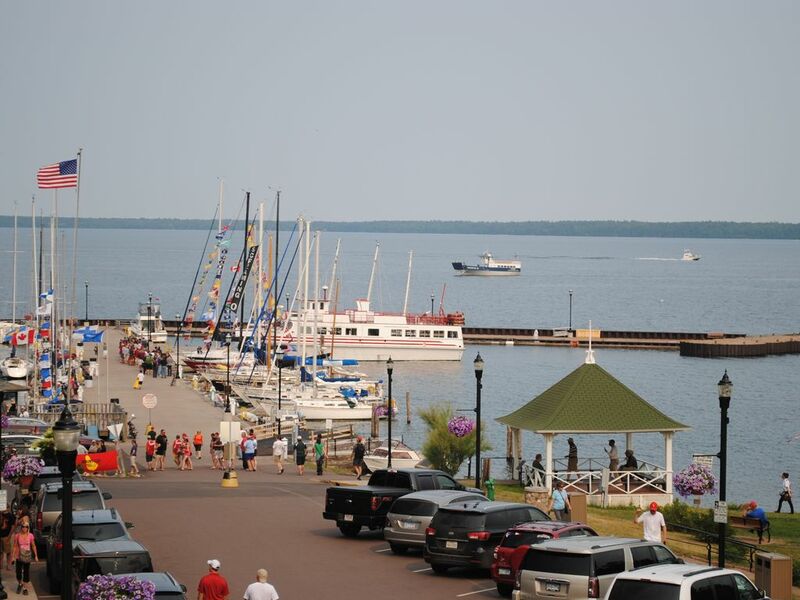 Best views of Harbor, Ferry, Madeline Island, Up & Down Town! The number one birds eye view to Apple Festival Parade, hands down! Wrought Iron Table and Chairs. Rent Bicycles at Bayfield Bike Route and Rental just 3 blocks SW of the Andrew Tate Condo. Also rent scooters and bikes on Madeline Island from Motion to Go. Table & two chairs with views of Madeline Island and downtown. You are just 1/2 block from the main harbor watching the sail boats & Madeline Island Ferry come and go. A birds eye view of downtown. Down Hill, Cross Country, Tube at Ashwa Bay Ski area just a few miles south of Bayfield on Hwy 13. ICE CAVES at Little Sand Bay, just 15 minutes north of Bayfield! Just a few miles from Bayfield golf 18 holes. Excellent views of the Apostle Islands. WiFi, Lake Views, Best location, luxurious, excellent Cellular Phone Coverage for phone calls or text messaging. The Best location & with views of N.W.E.S. Walk to everything and parking for 2 vehicles within steps of the entrance to Condo #200! Centrally located to explore Bayfield, Madeline Island via the ice road, and the ice caves at Meyers beach. Clean, comfortable, fully furnished kitchen, and a winter stay is so peaceful ! I'll be back! Thank You for your kind review and happy to hear you enjoyed the Ice Road to Madeline Island. We look forward to having you enjoy Bayfield and The Apostle Islands again and again! We recently stayed at the Andrew Tate Condo in February and thoroughly enjoyed our time. The condo was absolutely spotless when we arrived. The kitchen was equipped with everything we needed to prepare any meal we wanted. There is a full washer and dryer in the condo that was needed as we would ski and needed to wash/dry clothes for the next day. The local restaurants food was fantastic and everyone we meet was so kind and shared their love for the area. The weekend that we were there was during an event called Book Across the Bay (we didn't know this was going on this weekend until a waitress shared the event with us). It is a 10K from one side of the bay to the other and the registration fees support local grants. We participated in the event, it was awesome, and we highly recommend! The ice road to Madeline Island was very cool to drive across. There are several shops that are open, and the local owners are so appreciative of the visit and conversation. We are going to rebook for the summer and take advantage of the location and the known that this is truly home away from home! Great location and clean apartment. Great location and close to all in Bayfield. Walking distance to all attractions and restaurants. We appreciated the fireplace on the cold Saturday night. Communication with owners exceptionally good! Thank You for your kind review! We sure have had a lot of customers from Iowa this year and we really appreciate your business! Happy you found the Andrew Tate Condo to be within walking distance to all attractions and restaurants. Come back and see us again! Awesome condo and location and Jack was fabulous to work with! Only negative is it was loud at night as we heard the wind whipping around and cars/people outside like we were right there with them. Thank You for your review of the Andrew Tate Condo! We appreciate your stay and hope you will come back and stay at one of our properties in Bayfield, WI! The four of us had a great time in the condo. Everything was very clean and modern. We utilized the great kitchen to make some meals. The location was perfect and was in a couple blocks of the lake and shops/bars. We would stay again and recommend to others. Thank You for your stay at The Andrew Tate Condo! Best location in Bayfield, WI! Come stay with us again! Great little condo located in the heart of Bayfield. My husband and I stayed here for our babymoon and had a wonderful time. We enjoyed the views of the lake and of the downtown area. Great people watching views! The amenities were exactly as advertised and very updated. The fireplace was exactly what we needed on this cold weekend. Our pup also stayed with us which was a huge plus. Jack was a great host - even checked in on us during our stay! Happy you enjoyed The Andrew Tate Condo #200 in Bayfield! Best Location in Bayfield! Large Bedroom with closet, night stands, 1 Bedroom King. 1 Queen sofa sleeper in Living Room. Just one half block from main harbor dock, downtown Bayfield, WI. Look out at Lake Superior and Madeline Island. Watch the Madeline Island Ferry go back and forth from Bayfield to Madeline Island! Watch colorful Sail Boats. Coffee shop across street. Private Parking. Charter Sail Boats at the Harbor Dock just down from Condo #200. Apostle Islands Cruise Service is located on the Dock you see from the Balcony. Look up and down town at Restaurants,, Art Shops, Big top Ticket center. Grocery store just 2 blocks away.